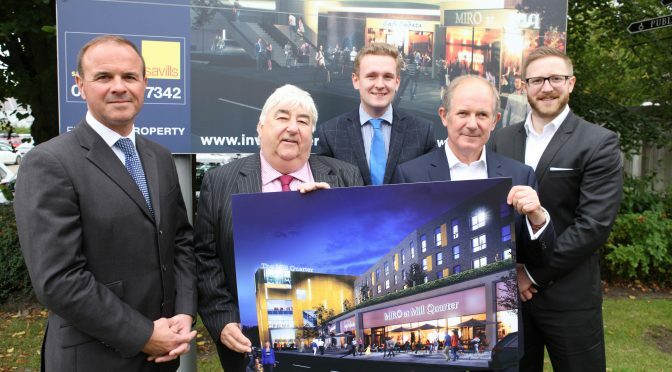 Expresso Property Ltd has announced that it has concluded missives on The Mill Quarter site, a brand new landmark mixed leisure scheme with residential apartments. The scheme will be a catalyst for economic change in Perth and will significantly transform the City’s visitor destination offer on completion. Construction works are due to commence in 2018 with works due for completion in summer 2019. Mill Quarter is a new leisure hub at the heart of the City, comprising a state of the art multi-screen cinema: a mix of bars; restaurants and speciality shops, a 205 space multi-storey car park and 58 new apartments. During the construction phase, the scheme will support 200 jobs, (107 direct construction jobs and 93 indirect supplier jobs), and will have an end investment value of £30m, creating around 126 new jobs in Perth on completion. The scheme has been designed by Holmes Miller Architects. Stephen Hampshire of Expresso Property said, “With the support of Perth and Kinross Council, Invest in Perth and designers of the scheme Holmes Miller Architects, we are pleased to be providing this new landmark leisure hub and also to play our part in creating over 300 jobs. The Mill Quarter development is a catalyst for change that will drive Perth’s economic growth and give the City’s residents a brand new leisure destination to be proud of”. Located in the heart of City of Perth, The Mill Quarter will also offer immediate access to the City’s main transport links as well as several bus routes and is within easy walking distance from its main retail and leisure zones. York-based Expresso Property, is funded to purchase schemes ranging from £1m to £50m, and has various UK schemes underway, comprising three major Scottish projects including The Mill Quarter, Perth. Expresso Property in conjunction with its development partner Ambassador Developments (Park Quadrant) Ltd is developing Park Quadrant Residences, a 98 apartment luxury development in Glasgow’s West End. Expresso Property has also been named as the preferred developer, by Scottish Enterprise, for a new mixed-use development at Pacific Quay. Expresso Property is looking to acquire further commercial, residential, retail, development propositions and offices, from Bath and Bristol to Birmingham to include Nottingham, Sheffield, Manchester, York, Leeds and all major cities in Scotland. CGI shows: The Mill Quarter is a new leisure hub with cinema, restaurants, parking and 58 residential apartments to be built in the heart of Perth by developer Expresso Property and will transform Perth’s visitor destination offer.